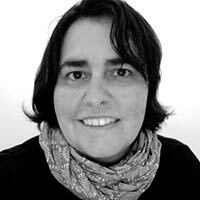 Gloria Lanci has a MA and DPhil in Architecture and Urban Planning, having completed her studies in the University of São Paulo, Brazil. Living in the UK since 2009 she undertook a post graduate programme on Applied Geographical Information Systems (GIS) at the University of the West of England, where she also collaborated in diverse research projects. Recently she concluded a project on urban history and football at the University of Bristol. Her research at Liverpool University’s Centre for Architecture and the Visual Arts (CAVA) looks at the representation of cities in artworks and in GIS mapping to question how new technologies are impacting visual perceptions of the built environment. It elaborates on the discussion of ‘two cultures’ in map making: the ‘utilitarian / practical’ nature of GIS, concerning accuracy, correctness and precision, and the ‘purposeless / speculative’ qualities of Art, embracing distortion, hybridism, imagination. How these categories are being contested in the contemporary urban world and what are the new narratives of cities in the digital age are central questions in this project.